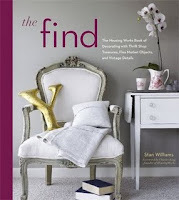 When I talk to those who've spent time with my book, The Find: The Housing Works Book of Decorating With Thrifty Shop Treasures, Flea Market Objects, and Vintage Details, this photograph, taken on the Fire Island getaway of Saltaire, remains among the most popular. 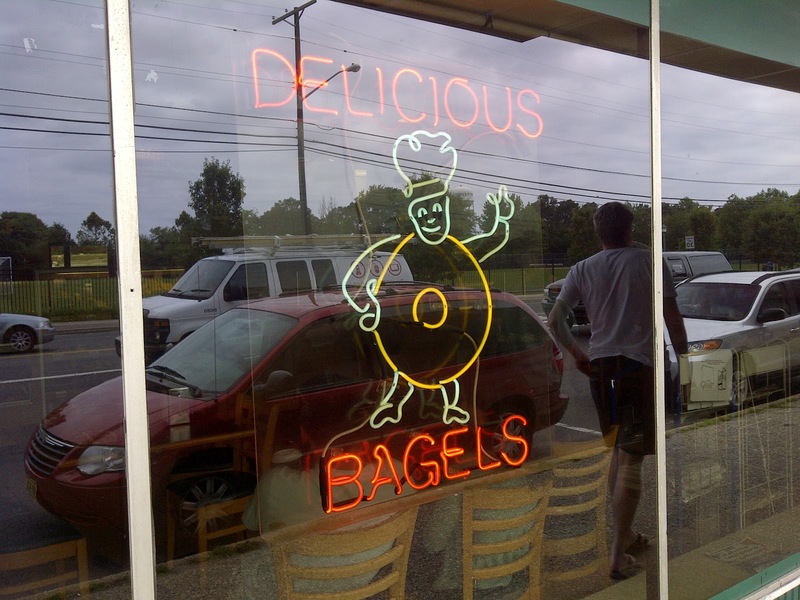 Maybe its because of the bold colors that attract the eye, or a design concept that almost anyone can imagine achieving. 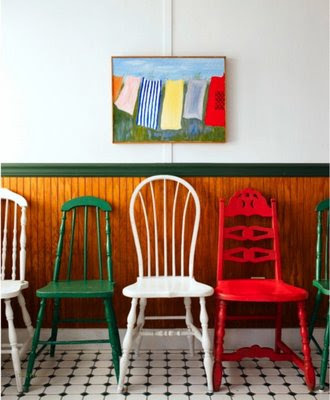 Here, chairs of different shapes and sizes become unified, thanks to an established color theme of red, white and green, accenting both the chair rail and the original artwork hanging above it. This inviting vignette practically says, "Come in and stay awhile!" Summertime was all about making crafts, whether is was turning baby food jars into sandscapes at Vacation Bible School, pouring candles on top of the kitchen stove or making Christmas ornaments out of kits ordered from the Leewards catalog, which sadly went out of business in the 1990s.These sparkly lovelies -- $5 for 13 at a garage sale in Point Pleasant, N.J. -- brought back those summertime memories, ones that culminated some six months later as we proudly placed our creations on the Christmas tree. I remember making colorful Santa boots, shimmering snowmen and out-of-sight holiday satellites on days when the temperature soared and we were forced to take refuge within the confine of central air. 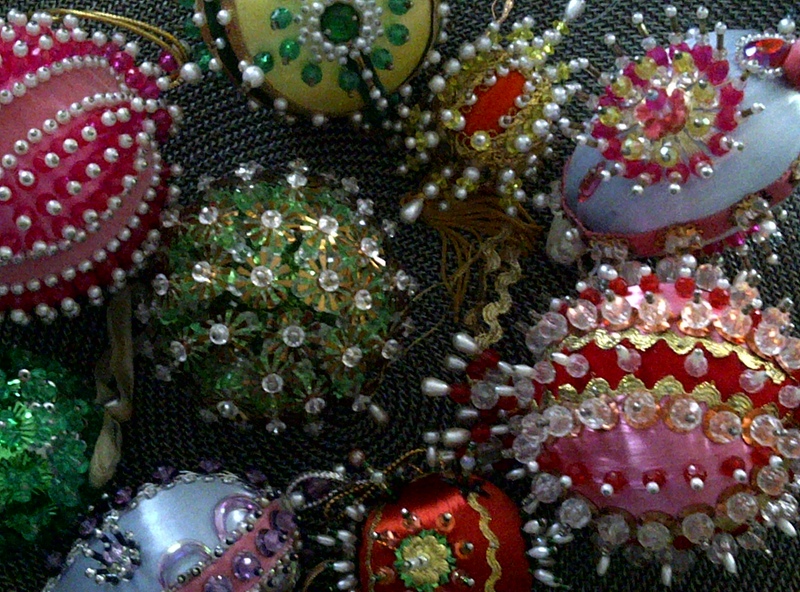 My sister and I were so enthusiastic about making these ornaments that I recall my pointer finger being sore from pushing so many pins into the Styrofoam shapes. It was almost like a race to see who could make the most, and when we ran out of a certain bead or sequin, we improvised with what we had, making for some quirky Christmas designs! I love toys, especially those that remind me of my childhood. While this Fisher-Price Discovery Map is from 1987 -- more like the year I graduated from the University than my kindergarten days -- it was made in the United States, which is a rarity these days. Spotted on the front steps of a home in Point Pleasant, New Jersey, this relic of the past was picked up for a few dollars and offered it to my nephew for Christmas last year. On each state is a tiny hole that when peered into with an attached magnifying glass, viewers will discover all kinds of facts, such as its capital or a noteworthy landmark. I think I may hold onto them them as a gift to myself. Rrrrribbit! One thing I always look forward to on my visits to Point Pleasant, New Jersey, is breakfast, and this is why. 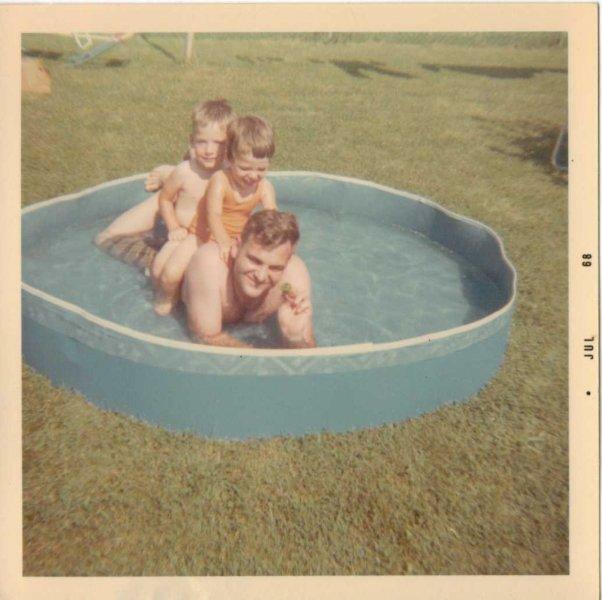 In the swimming pool with my sister Cheryl and Dad from the summer of 1968. My most treasured gifts are the ones that the giver has taken the time to scour a flea market, peruse a garage sale or sift through a thrift store just to find something for me. But when that discovery comes from one of my favorite shopping spots -- the flea market in Britanski Trg in Zagreb, Croatia -- then it's extra-special-plus-super-dooper! 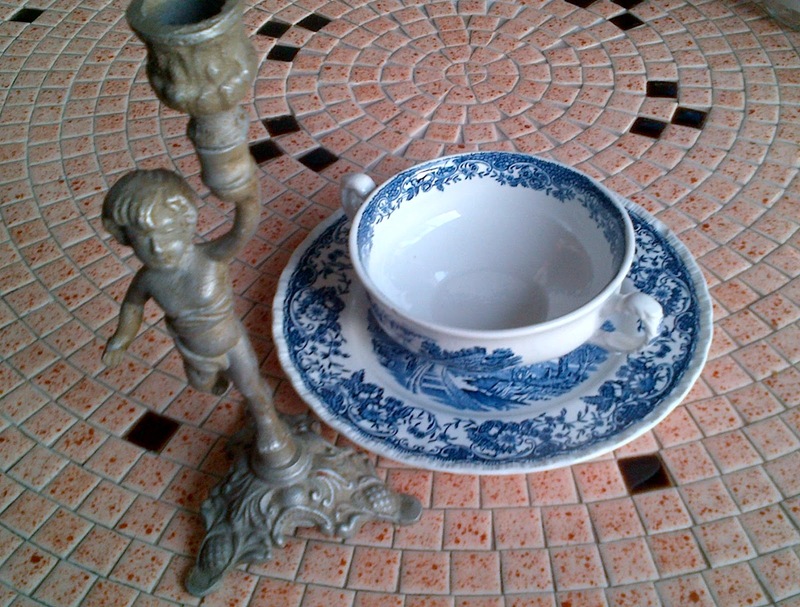 Recently, a friend from Zagreb came for a visit bearing gifts from that flea market -- a cheerful metal cherub candle holder and an Old English Staffordshire bowl and dish. What a perfect gift of thrift! At long last, I have a new coffee table. After searching high and low, I finally picked up this gorgeous pink and black tile table at last weekend's Town-Wide Garage Sale on the Jersey shore, benefiting the Point Pleasant Beach High School. This table made in the 1960s by Interstate Marble & Tile in Miami, Florida, is in excellent condition and set me back a whole $22! I'm still amazed. Words can be enchanting and encouraging, often helpful and sometimes hurtful. 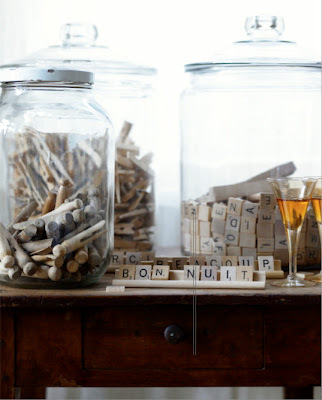 Maybe that's why a random mix of letters like those found on the tiles in a Scrabble board seem to provoke thought and inspire creativity wherever they are gathered. I featured this photograph in The Find: The Housing Works Book of Decorating With Thrift Store Treasures, Flea Market Objects, and Vintage Details because I was charmed by the way Yasmine McGrane from Maison Rêve carefully sorted vowels and consonants to offer welcoming words to a visitor or randomly grouped them in a vintage apothecary jar. When The Find first came out, one critic noted that bonne nuit wasn't correctly spelled in French. That is true in this picture, but anyone who's ever played Scrabble knows that you can only have seven tiles on your rack, and that there's probably an open ne just waiting for the bon moment! Standing at attention on the sidewalk in front of a Bleecker Street boutique, these apparel forms caught my eye as I was out on a mid-afternoon stroll.